Travel with Kevin and Ruth! : How to rust proof your car. And growing up in Ottawa, Ontario, Canada I know about rusty cars. The city of Ottawa uses 180,000 tons of road salt every winter and it's devastating to the body of a vehicle. So, even back in the early 1980's before I got into the car business I was already researching how to stop a car from rusting. There's only one product that really stops steel from rusting, and that's oil. The problem is that there are many different types of oil. And there are different manufacturers of oils that are made specifically for vehicle rustproofing. Each one has their own formulation and chemical properties. In Eastern Ontario, there have been three main "oil spray" choices over the past 30 years. The original was called "Oil Gard" and I used to use them a lot in the beginning. Then, shortly after that a better choice came along called "Rust Check" and at the time they seemed to have better trained guys doing the application. Half of the job of rustproofing your car is the guy doing the job. The other half is the product itself. But I like to do these things myself. And, I like to save money (no way, you say!) so today, I gave the little blue car it's annual rustproofing. Yes, I have been doing this every year since 2006. And there is no rust on this car. And I took a few photos to show you how it's done. But first, let me tell you a little about rust. 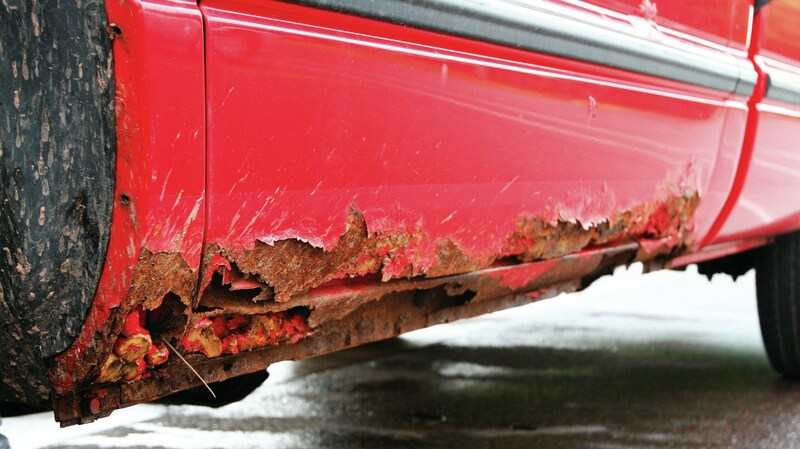 Cars can have two different types of rust. There is "surface" rust, and there is "structural" rust. It's actually the same rust, but we call it different names because of where it appears. Surface rust is what you might see if you get a stone chip on your hood or a scratch that goes right through the paint. And after a couple of years it starts to bubble. It's unsightly, but it's not a structural problem. And surface rust takes many many years to become an actual rust hole. Structural rust happens at seams and normally starts on the inside of a panel where you can't even see it. Even though you can't see it, it's the worst type of rust. Because the rust starts on the inside of the panel, by the time you see it, it has worked it's way from the inside to the outside, and now it's a rust hole! 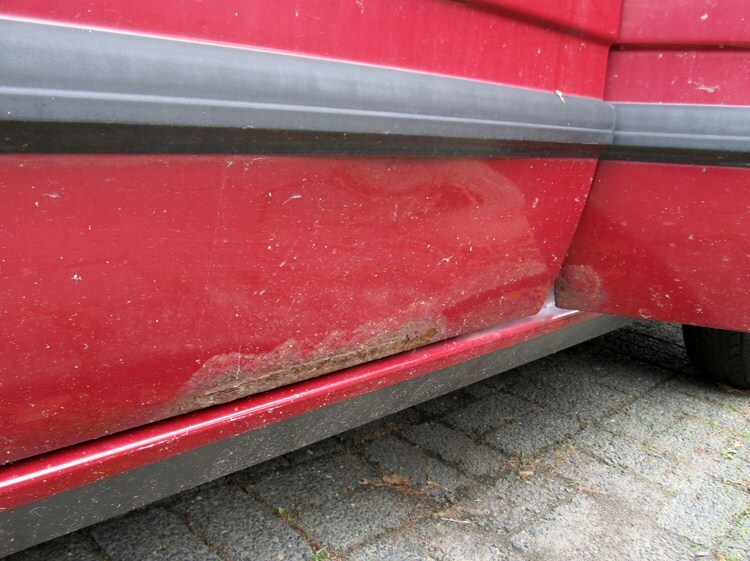 Rocker panels and lower door seams are most often hit by structural rust. This door bottom is only starting to rust through. It doesn't look as bad as the first picture, but it's actually rotten. Like I said, it's rusting from the inside out. Okay, so by spraying oil inside the panels, we're going to stop it from rusting from the inside out, right? Right. Let's get to it and we'll show you how it's done! I start at the front and work my way back. This is the stuff we're going to use. Two cans ($8.00 each) is exactly enough to do the little blue car. Pretty much any vehicle larger than the little blue car is going to need three cans. There is some mechanical work involved, but as a do-it-your-selfer you've probably got some hand tools around. I removed the headlights and the grille to have easier access to the rad support and the inside edge of the front fenders. Now, the reason we can do the entire car with just two cans is because we're selective about where we spray the stuff. Cars almost always rust in the same places. Seams, and the lower six inches of any panel. So while many rustproofing places waste material on coating the entire inside of a panel, we're only going to target areas that are likely to rust. You're looking for areas like this. Anywhere two pieces of metal are joined together. Shock towers can be liberally coated. You want to use about half a can just doing the engine compartment and rad support structure. Notice from the picture above how nice and clean the shock towers are. Even though I've been rustproofing them annually, I also power wash the engine compartment every couple of years to get rid of the accumulated crap, which also removes most of the rustproofing that had been applied over the years. I do this for two reasons. The first is purely aesthetic. It looks better when it's nice and clean under the hood! But it's also easier to work on if you have to do a tune up or oil change if all the greasy stuff is gone. After you're done the engine compartment, you've got the hood open anyhow, so now you can do it. Access holes are your friend when you're rustproofing! Simply use the directional spray tube that comes with your can of rustproofing, put it in the hole, and aim it towards the front edge seams. The product "creeps" over time, so if you miss a spot or two it's not a big deal. But again, you can be fairly liberal. Before you put the headlights back in, you want to aim the directional tube on the inside lip of the front fenders. Again, only on the lip. No need to spray any product higher than about three inches from the bottom of the panel. Don't forget to give a quick shot to the hood hinges! Moving on to the front fenders. To do them properly, you should really take the wheels off. It's easier to get access to everything. You could probably cut corners to save time, but it really is easier to do a good job this way. because you're going to want to at least partially remove the front fender liner to access this inside of the lower fender, and with the little blue car in particular to get rid of the build up of crap that occurs at the rear edge of the fender. Once you've got the wheel off, it's easier to access the inside of the fender. With the little blue car, you only need a phillips screwdriver, a 7mm socket, and a 10mm socket. Notice the build up of mud and crap that is inside the lower fender where it meets the front door. You want to clean all of this out of there, and I even go so far as to remove the single 10mm bolt that holds the bottom of the fender on to the rocker panel pinchweld seam. Everywhere you see one of these access holes you want to pull the rubber plug out and liberally spray towards the lower seam. This will get all kids of rustproofing product inside the front of the rocker panel. Then, you can spray the rest of the inside of the fender. Remember, you only need to do the lower 3 inches or so. While you're at it, and you have access to it, you can spray any seams of the inside of the wheelhouse and shock tower. Now, you can re-install the liner and put the wheel rim back on. With the little blue car, it's easy to lift up the interior rocker panel scuff plate. This allows access to three small openings that you can liberally spray product into that will soak it's way down to the lower seams of the rocker panels. If you have a four door car, you do this for all four sections of the rocker panel. Shops that do rustproofing, Krown and Rust Check included will not do a lot of this taking things apart. They have special wands that makes it easier for them to get material to some of these places, and they drill access holes where they need them. Plus they have to process a lot of cars each day and they would need to charge a lot more than $120 per car if they spend the time to take things apart. For them, it's a lot easier to drill a hole and put a plastic plug in the hole where necessary to cover the hole afterwards. In an ideal world, I don't really want any extra holes drilled in my car. The doors are easy to rustproof. They already have two or three drain holes at the bottom so you can use these access holes to get the rustproofing product right where you need it. Simply aim the directional nozzle where you want to spray it. Don't forget to do it in both directions! And spray the door hinges while you're at it. Obviously, do the same procedure for all doors. The rear quarter panels can be a bit tricky depending on the vehicle. On the little blue car (Chevy Aveo and Pontiac Wave) it is difficult to get material into the quarter panel dog leg section. This is a rust prone area on a lot of vehicles, and without drilling holes we need to get creative. 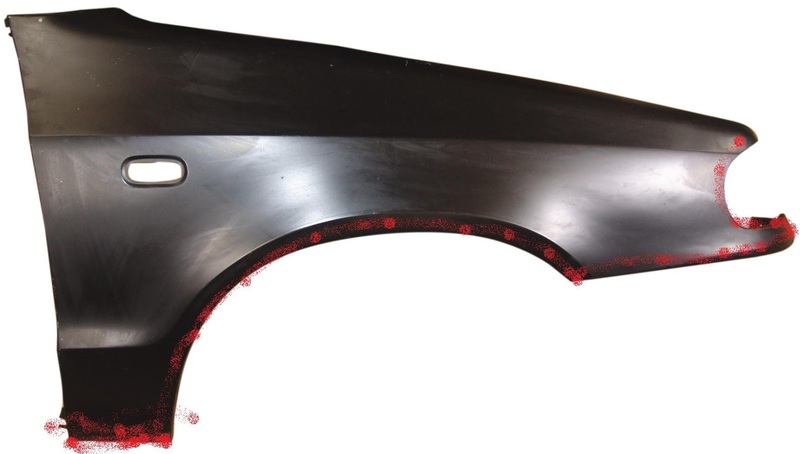 The front section of the rear quarter panel is called the "dog leg". It's a double walled panel, and a prime area for rust. So with the little blue car we have to partially remove the interior trim panel to gain access to the structure on the inside. On the inside, you find access holes where you can spray the product. Still difficult, so again you want to get a lot of it in there. Better too much than not enough, and because the oil creeps, it will end up where it needs to be if you get enough of it in there. Then, you can do the inside of the wheelhouse and the rear section of the rocker panels. Easy to do with our car because there are access holes. Simply remove the rubber plug, and spray away! Don't forget to do the lip around the wheelhouse, and any other area where you see a seam. You can then do the trunk or rear hatch. These are as easy as the doors and front hood. There should be access holes that easily allow you to get material where it needs to be. You're now done! Any left over material can be used to touch up some of the undercarriage, but modern cars are not nearly as prone to floor rust as they used to be back in the 80's and 90's. If you're at all unsure about getting the stuff in the right place, err on the side of caution and go ahead and spray it. It won't hurt to get it somewhere that it doesn't really need to be! If you have a Krown location near you and you're at all worried about not getting the product where it needs to be, I would get your first application done there. Then, you can do subsequent annual applications yourself, knowing that there is already some of their product where it should be. Although, these guys are only human and they run production facilities. I have seen times where the pros have missed areas that need to be done, and I also know that areas like the lower inner fenders would have remained full of mud and crap because they don't take things apart like they would have needed to in our case. And even if you never have plans on rustproofing your own car, at least you now know a little more about the procedure and hopefully that makes it easier for you to properly maintain your vehicle! If they did it as thoroughly as Kevin does, it would cost even more. Wow...what a thorough job. That little blue car does look like new. And, we are hoping to keep it this way! Thankfully we do not have this problem in Vancouver. A very useful post! You are very lucky then! Do you ever have any problems with the salt from the ocean spray? Fortunately rust isn't an issue in the desert southwest either. But as a kid in Michigan, I remember my dad had "Ziebart" rustproofing applied to his new Ford Pinto. Now I know what all those little yellow plugs were about! Kevin said that "Ziebart" is the worst rustproofing out there! Car dealerships are making a killing when they offer this "service" with new cars by way over charging their clients for a product it is not very good and then not applying it well. This is just his opinion from being in the body shop car repair business for many years. Just catching up with your recent posts. I am so excited about your forthcoming trip and loved your post about 8 things to research-I wish I was going on that train, it reminds me of those in Japan! Can't wait to hear about your templestay accommodation. I bought a book about Japanese etiquette before I left and made sure I read it! Love the sand dune photos! You are so clever when booking flights. I love that you got a flight for free-and with carry on luggage too! I would call you the king and queen of airfares. I am dumb struck that you are being sponsored by Tilly and got those lovely clothes for free. They are sooooo expensive. I was only lucky to get my hat because I was given it as a present. I am so happy for you and I know that you will appreciate and love them and use them again and again. Isn't the South Korean currency beautiful? Not long now....Are you getting excited? We are super excited about our trip too! We are down to just a few days away now. Kevin "lives" to find the best airfare prices and so far he has done an amazing job of it. As for the carry on luggage, we carry bags that fit most airlines requirements for carry on and we try very hard to keep our weight at 10kg or less, which is where we will be putting our Tilley clothes to the test as they are lightweight compared to many "normal" clothes. We can't wait to see how well our Tilley clothes will stand up to our travels as most of our clothing on this trip will be two different outfits and an jacket so they will get lots of wear for the next two and a bit months. Wow this is a lot of work. No wonder the little blue car looks so great. Do you do the motor home too. Seems like folks living near any type of salt water should be seriously careful about this. Great informative post. Thanks Kevin! Yes, it is a fair bit of work but definitely worth it! Yes he does but only in select areas as the motorhome was not looked after properly in this aspect before we bought it. Since we have owned it though it has not deteriorated more since Kevin has been "rustproofing" it in the worst areas. It does take some time and some patience but it does pay off. And, no we won't be wintering in Florida, and even they have problems with salt if you are near the ocean because of the salt in the ocean spray. I am a day late but thanks. I am not sure why this isn't more common here in the NE part of the states. Rust belt is what we are called but really never heard of except for the zebartt and Rusty Jones both of which were failures. Thanks for rhe walk through. No problems GMF, better late than never. Sure hope it will help you out. Let us know how it goes if you go ahead and do it yourself. Of course you can do it yourself, especially if the dealership will let you do it in their space. You'll probably have access to all the right tools and someone to help if you get stuck on taking something apart for access to spray the rustproofing. On a new vehicle, I would do it as soon as possible, but of course better late than never. How about Waxoyl? I have it on 2 cars and you apply only once and should last life of car. Got it done at a shop in MA for $550 but only needs one time spray ...underneath and inside body panels. I don't have any experience with the product, so I can't really say. It depends on how fluid the product is. I do have a problem with "one time" applications though because the quality of the job totally depends on the one guy who does the spraying. If he misses only one rust-prone spot, it will rust. However, if the job is done annually, there is virtually zero chance that the same spot will be missed twice. Doesn't wd40 do something similar? Similar yes. But WD40 is much more likely to wash off....it doesn't have enough thickness to stay stuck to the metal. Great Article! I have a 2015 Tacoma no rust and a 2006 Jeep Rubicon. We do not have Krown stores here in Indiana. We do have Rust Check that looks similar as you mentioned. My plan is to treat the Tacoma and do as you mentioned Rust Check it and then retreat myself every year. The Jeep has surface rust on the frame, brake lines and odds and ends underneath nothing major .. my question for the jeep is should I go head and use a rust encapsulor, rust converter and a good quality top coat of paint before I have it sprayed at Rust Check? the Rust Check will stop it in it's tracks. If I do it by myself, one thing is that underside can not be done easily since I can't lift cars. So what should we do for underside? Really, all you can do is to reach under with the spray can in your hand and do the best you can. Car floors are not as prone to rust as they were back in the 1970's, but you should still try and get some protection there if you can. Thanks for your post on rust proof. I'm planning to buy a Honda CRV. When I talked with dealer on rust proof. They offer a dealer solution with rust proof and undercoating. But they spray wax-like things for rust proof and can guarantee 10 years if done just once. Do you think this is reasonable or possible? They also said oil spray harms sensors. First of all, oil spray does not harm sensors. Next, dealer sponsored rust "protection" programs are nothing more than a profit center for the dealership. Read the guarantee very carefully. About the oil, I read in forums that known brand is hard on the rubber. A lot of people complaint about known oil that damage the door rubber. Do you have any experience on that ? Did you use other oil brand and notice any differences? Thanks for your DIY rustproofing! Yes, some oil products are in fact hard on weatherstrip rubbers. That's another reason I like doing it myself, so that the rustproofing only gets where it needs to be...rather than everywhere! Does anyone know if it's a good idea to use a silicone sealer around the plastic plugs after Krown Rust guys are finished? I notice they often seem to put little or no gel/silicone in these area. I wouldn't use a silicone sealer. I would simply put some ordinary automotive grease on the inside of the plug, and press it back into place. Hi Kevin, I use Oil Gard on my car every year and they have a no drip formula. They're the only one I found like that. I go to a shop in London and they have a huge hoist so we can get our RV done too, so we can travel more!! I agree rust proofing with oil is the only way to go. I was talked into that electrical thing once - stay away!! Personally, I like the drippy stuff. It's better for creeping into seems. Yes, good idea to get the RV done as well! There are car dealers in this area who won't do repairs on cars with Fluid Film applied. The mechanics complain that it makes their tools slippery and they take too long to do any work . One mechanic said it's like cooking oil on tool handles. If the product is applied correctly, it won't be anywhere near anything mechanical. Too many applicators spray the stuff everywhere, in a lot of areas that it doesn't need to be. I bought my 2015 Ford Focus new.Next day did rust proofing at Krown each year did the same in month of june three times at Krown.Now I am going to do it myself bye your instructions found them very helpful and clever+logical.Got Krowns sprays (12 cans/in one case-no shipping fee).I want to keep my car for as long as I can.